The aim of the present study was to examine the prevalence of gestational diabetes mellitus (GDM) among pregnant women attending a family health center between 24 and 28 weeks of gestation, and to assess the risk factors. GDM is defined as any degree of glucose intolerance with onset of, or first recognized during, pregnancy. Screening for GDM during pregnancy is recommended. This cross-sectional study was conducted on 250 pregnant women between 24 and 28 weeks of gestation who attended the Monshaat Sultan Family Health Center. Risk factors for GDM were estimated using a self-designed questionnaire and initial screening was carried out by a glucose challenge test with 50 g glucose. If 1-h blood glucose level exceeded 130 mg/dl, then a 3-h oral glucose tolerance test with 100 g glucose was carried out and diagnosis was established. The prevalence of GDM among the studied group was 8%. Risk factors found to be significantly associated with GDM were advanced age, BMI greater than or equal to 30, high blood pressure, multiparity, preeclampsia, family history of diabetes, induced labor, abortion, preterm deliveries, large-sized baby, and smoking. However, socioeconomic status, small-sized baby, still birth, previous history of hypertension, and family history of hypertension failed to demonstrate significant associations with GDM. The prevalence of GDM among pregnant women attending Munshaat Sultan Family Health Center was found to be relatively high compared with other studies. Controlling risk factors and screening for early detection are mandatory for better maternal and fetal health. Gestational diabetes mellitus (GDM) is the most prevalent metabolic disorder during pregnancy. It is defined as glucose intolerance of varying severity diagnosed during pregnancy that usually resolves postpartum. It typically occurs during the middle of the pregnancy and is diagnosed at 24–28 weeks of gestation with an oral glucose tolerance test (OGTT) . Numerous epidemiological studies show that this disorder affects between 1 and 18% of pregnancies, depending on the ethnicity of the populations studied, the diagnostic criteria, or the BMI. Its incidence has been reported to be constantly rising . The prevalence of GDM in Egypt is 7.2%, and in the USA it ranges from 3 to 7%, depending on the population studied . The basis of the abnormalities in carbohydrate, fat, and protein metabolism in diabetes is the deficient action of insulin on target tissues . Factors that have been already reported to influence the risk for GDM among mothers include previous history of GDM, family history of diabetes, obesity, recurrent urinary tract infections, infertility treatment, unexplained neonatal death, macrosomic babies, prematurity, preeclampsia, and advanced maternal age . The clinical presentation of diabetes mellitus (DM) in pregnancy may be quite varied. The patients may present with a previous history of medical complications of DM (chronic hypertension/chronic renal disease) and obesity . The International Association of Diabetes and Pregnancy Study groups has introduced new GDM criteria. The International Association of Diabetes and Pregnancy Study groups criteria require three samples – that is, fasting, 1, and 2 h after 75 g glucose, whereas the WHO criteria need two samples, namely, fasting and 2 h .
GDM is a reversible condition and women who have adequate control of glucose levels can effectively decrease the associated risks and give birth to healthy babies . The aim of the present study was to examine the prevalence of GDM among pregnant women attending Monshaat Sultan Family Health Center between 24 and 28 weeks of gestation and to assess the risk factors for GDM in the studied group. This cross-sectional study was carried out on 250 pregnant women during the period from the 1 December 2014 till the end of July 2016 in Monshaat Sultan Family Health Center, Menoufia district, Menoufia governorate, Egypt. An approval from the Ethics Committee of the Faculty of Medicine, Menoufia University, was obtained. The study included pregnant women who attended Monshaat Sultan Family Health Center for any services from 10:00 a.m. to 2:00 p.m. during the period from the 1 February 2015 till the end of September 2015 (8 months) and fulfilled the inclusion and exclusion criteria. Pregnant women between 24 and 28 weeks of gestation period and co-operative women. Pregnant women known to be diabetic before pregnancy, women with a past history of GDM in prior pregnancies, and refusal to participate in the test. 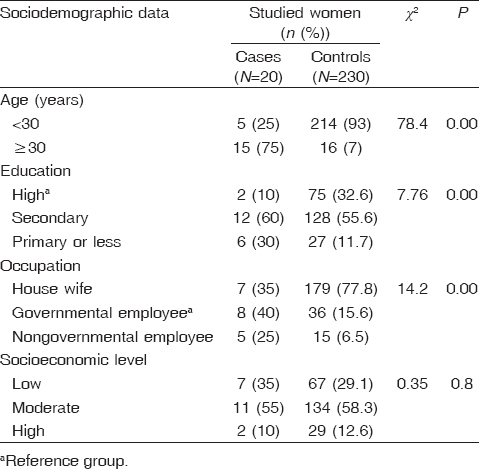 All pregnant women included in the study were interviewed using a questionnaire that included personal data (age, education, occupation); socioeconomic standard of the participants was determined according to the scoring system proposed by Ibrahim and Abdel Ghaffar, after modification to suit the current socioeconomic status in Egypt. It includes education, occupation, family size, and family income. The socioeconomic scores were as follows: high (9–12), middle (5–<9), and low (<5). Furthermore, it included questions to assess risk factors for the disease, involving lifestyle habits (as smoking), family history of chronic diseases (as diabetes, hypertension), BMI before pregnancy, parity, previous history of small-sized baby, large-sized baby (≥4 kg), preterm deliveries, preeclampsia, still birth, and previous history of abortions. Data taken from cases and controls groups were put in tables of comparison to determine the significant risk factors for the disease. Initial screening was done by a glucose challenge test with 50 g glucose. If the 1-h blood glucose level exceeded 130 mg/dl, then a 3-h OGTT with 100 g glucose was carried out and diagnosis was established according to the American Diabetes Association Criteria (principle: glucose is phosphorylated by ATP in the presence of hexokinase and Mg 2. The glucose-6-phosphate formed is oxidized by glucose-6-phosphate dehydrogenase to 6-phosphogluconate in the presence of nicotineamide-adenine dinucleotide. The amount of NADH produced is directly proportional to the amount of glucose in the sample and is measured by absorbance at 340 nm) . The following are the values that the American Diabetes Association considers to be abnormal during the 100 g OGTT: fasting plasma glucose level greater than or equal to 105 mg/dl (5.8 mmol/l), 1 h plasma glucose level greater than or equal to 190 mg/dl (10.6 mmol/l), 2 h plasma glucose level greater than or equal to 165 mg/dl (9.2 mmol/l), and 3-h plasma glucose level greater than or equal to 145 mg/dl (8 mmol/l). For a positive diagnosis, two or more criteria must be met or exceeded . Data were statistically analyzed using SPSS with statistical package (version 16, SPSS Inc., Chicago, Illinois, USA). Numerical data were expressed as mean and SD or median and range as appropriate. Qualitative data were expressed as frequency and percentage. The c2-test was used to examine the relation between qualitative variables. For quantitative data, Student's t-test was used to collectively indicate the presence of any significant difference between the two groups for a normally distributed quantitative variable, and Pearson's correlation analysis was used to show strength and direction of association between two quantitative variables. A P-value less than 0.05 was considered statistically significant difference and a P- value greater than 0.05 was considered statistically nonsignificant difference. A total of 250 pregnant women between 24 and 28 weeks of gestation were included in the study. The present study found that 22.4% of the pregnant women between 24 and 28 weeks of gestation were positive for GDM when screened by using 1-h oral glucose challenge test (OGCT) [Figure 1]. 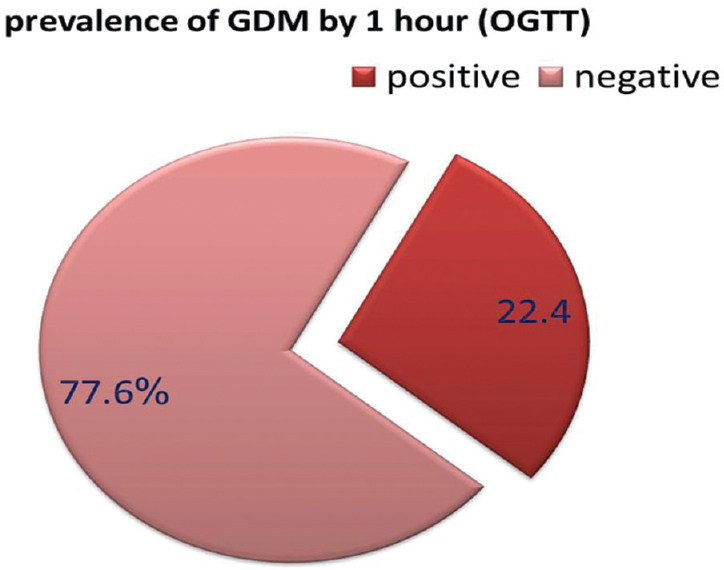 The prevalence of GDM according to screening with 3-h OGTT was 8% [Figure 2]. 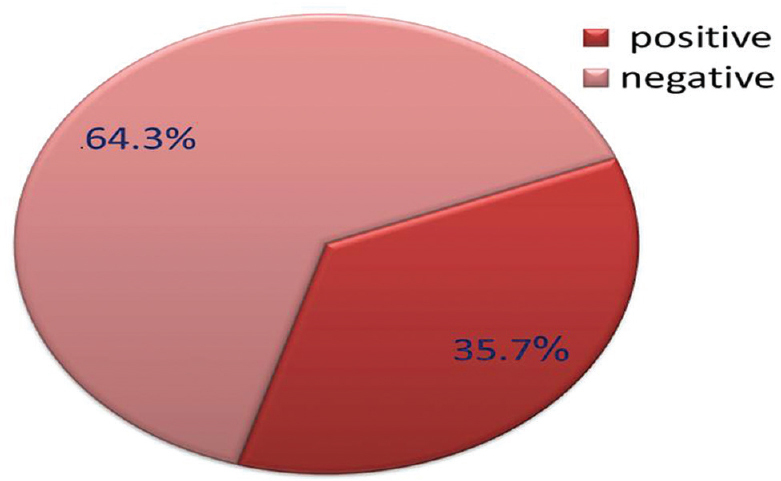 Figure 1: Prevalence of gestational diabetes mellitus (GDM) according to screening with 1-h oral glucose challenge test (OGCT) among the studied pregnant women. Figure 2: Prevalence of gestational diabetes mellitus (GDM) according to screening with 3-h oral glucose tolerance test (OGTT) among the studied pregnant women. Among those with positive 1-h OGCT, only 35.7% had positive 3-h OGTT [Figure 3]. Figure 3: Prevalence of gestational diabetes mellitus (GDM) according to 3-h oral glucose tolerance test (OGTT) among the studied pregnant women with positive 1-h oral glucose challenge test (OGCT). There was a statistically significant difference between the cases of GDM and the control group regarding age, education, and occupation, being more prevalent at age greater than or equal to 30 years old, among those with secondary educational level, and among governmental employees. However, no significant relation was found between the two groups regarding socioeconomic level [Table 1]. 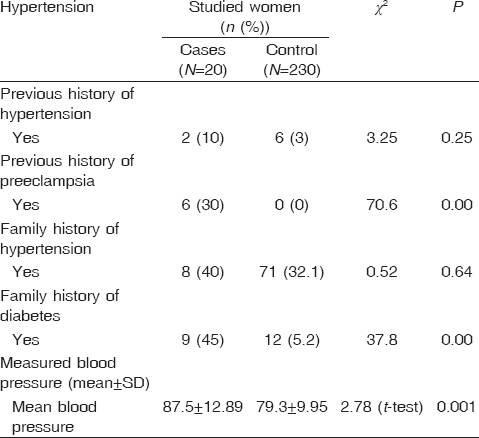 There was no statistically significant difference between the case group and the control group regarding previous history of hypertension and family history of hypertension. However, there was a significant difference between them regarding previous history of preeclampsia as 100% of participants in the control group had a negative history for preeclampsia [P < 0.001, odds ratio (OR)=17.4]. The mean ± SD for measured blood pressure (BP) was significantly higher among the positive cases for GDM. About 45% of the cases with GDM had a family history of DM; this association was found to be significant (P < 0.001, OR = 14.86) [Table 2]. 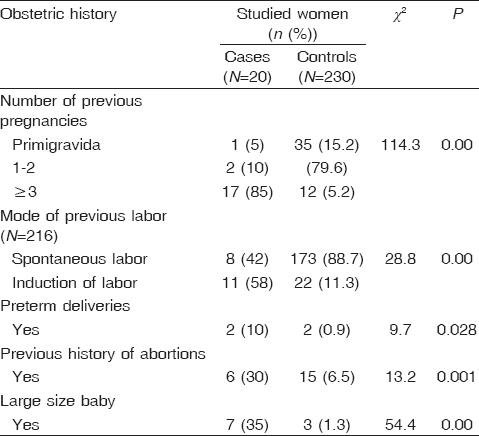 There was a statistically significant difference between cases and control groups regarding parity, induction of labor, preterm deliveries, previous history of abortion, and large-sized baby, as 85% of the cases were multigravida, 58% had a previous history of induced labor, and 99.1, 93.5, and 98.7% of the control group had a negative history as regards preterm deliveries, abortion, and large-sized baby, respectively. However, there was no significant difference between them regarding small-sized baby and still birth [Table 3]. There was a statistically significant difference between cases and control groups regarding passive smoking and BMI, as 85% of the cases had been exposed to passive smoking (P < 0.001, OR = 20.4), and 80% of the case group participants had a history of obesity (BMI ≥ 30) before pregnancy (P < 0.001, OR = 15.7) [Table 4]. The most significant risk factor for predicting gestational diabetes (GD) was history of large-sized baby (P < 0.001, OR = 48.6), followed by history of passive smoking (P < 0.05, OR = 12.06) and family history of DM (P < 0.001, OR = 6.57) [Table 5]. The current study was conducted at Monshaat Sultan Family Health Center to study the prevalence and risk factors for GDM. This cross-sectional, analytical study included 250 pregnant women between 24 and 28 weeks of gestation who were interviewed to assess the risk factors for the disease. Screening tests with 1-h OGCT and confirmation with 3-h OGTT was carried out: 56 (22.4%) of the studied pregnant women had an initial positive 1-h OGCT result of greater than or equal to 130 mg/dl. Confirmation of diagnosis of GDM with 3-h OGTT was carried out, and 35.7% of those with positive OGCT were finally diagnosed with GD. In the current study, the prevalence of GDM among the studied pregnant women was 8%. These results were in agreement with those of Swami et al. in India who reported a 7.7% prevalence of GDM. However, studies conducted in Iran  and in Ethiopia  reported 3.41 and 5.7% prevalence of GD, respectively. This difference may be related to the screening methods, diagnostic criteria used, or the populations studied. GDM was more frequent among those above 30 years old (P < 0.0001). This was in agreement with the findings of Seshiah et al. in South India who observed a significant increase in the prevalence of GDM with increased maternal age. Furthermore, Kanadys  in Poland stated that age more than 35 years increased the risk for GDM by more than threefolds (OR = 3.10). Regarding preeclampsia, this study showed a significant relation between previous history of preeclampsia and GDM (OR = 17.4). This was in agreement with the findings of Schmidt et al. in Brazil who confirmed that GDM is independently associated with preeclampsia. A family history of diabetes has a strong correlation with the occurrence of GDM. The study reported a positive family history of diabetes in 45% of the women with GDM compared with 5.2% in the control group. This association was found to be significant. This was in agreement with a study conducted by Soheilykhah et al. in Iran who reported a positive family history of diabetes in 76% of the women with GDM compared with 43% in the normal group, and also Rajput et al. in India who reported a significant association between family history of DM and development of GDM. In Turkey, Erem et al. reported GDM to be significantly and independently associated with history of diabetes in first-degree relatives of the pregnant women (OR = 4.5). Regarding BP measurement in the current study, a significant relation was found between GDM and the mean BP (P < 0.05). Leng et al. in China observed higher systolic blood pressure (SBP) and diastolic BP positively associated with the risk for GDM (P < 0.001, OR = 1.31). In addition, Erem et al. in Turkey found that GDM prevalence increased with SBP, but the relationship between SBP and GDM prevalence was only of borderline significance (P = 0.052). This is in contrast to Zokaie et al. in Iran who found the present BP not related to the prevalence of GDM (P > 0.05). The prevalence of GDM in the present study was found to be statistically related to parity greater than or equal to 3 (χ2 = 114.3). This is in agreement with a study conducted by Yang et al. in China who found a greater ratio of women with GDM in the group with parity greater than 2. This is in contrast to Seghieri et al. in Italy who reported that parity is not directly linked to the frequency of GDM. In addition, Duman  in Pakistan reported that the number of parity has no effect on the risk for GDM. The current study reported a significant relation between the cases of GDM and previous history of induced labor (OR = 1.43). The rate of primary cesarean section in the GDM group was higher than in the non-GDM group (58 vs. 11.3%). Aktun et al. in Turkey showed a significant association between previous history of induced labor and GDM. The rate of primary cesarean section in the GDM group was significantly higher than that in the non-GDM group (29.6 vs. 15.3%) (OR = 2.35). The present study found out that previous pregnancy outcomes such as premature deliveries is higher in the GDM group than in the non-GDM group (10 vs. 9%). This is in agreement with Brody et al. in USA who found glucose intolerance in 14.5% of women who had adverse obstetric outcomes. Furthermore, Capula et al. in Italy stated preterm delivery as a risk factor for GDM, as GDM was significantly higher in women with a history of preterm delivery compared with those in the healthy group (P = 0.118, OR = 1.94). The study observed previous history of abortion as risk factor for GDM, as 30% of the cases group compared with 6.5% of the control group had a previous history of abortion. This is in agreement with Saxena et al. in India who found spontaneous abortions in previous pregnancies had a greater incidence of GDM in current pregnancy. In the present study, birth of child weighting greater than or equal to 4000 g was significantly associated with development of GDM (OR = 12.9). This is in agreement with Ali et al. in Yemen who observed a significant association between GDM and previous macrosomic baby (GDM = 15.8 vs. 3.7%, P = 0.003). In addition, Zokaie et al. in Iran showed that a history of macrosomia is a risk factor that is associated with the prevalence of GDM (P < 0.05). Passive smoking in current study was found to be one of the risk factors for GDM (OR = 20.4). In their study in Turkey, Erem et al. showed a significant association between the prevalence of GDM and smoking. In addition, Leng et al. in China showed that habitual smoking before or during pregnancy was positively associated with the risk for GDM (P = 0.012, OR = 1.42). This is in contrast to Kirke et al. in Australia who found that smoking was not significantly associated within the group of women with GDM. In this study, GDM was found to be significantly more prevalent among women with higher BMI (>30 kg/m 2) and higher prepregnancy weight. They had 15 times more risk for GDM than did nonobese women, which is in agreement with Rajput et al. in India who reported a significant association between the prevalence of GDM and increasing BMI of participants. Ciazowa et al. , in their study in Polaska, observed that occurrence of GDM in women with BMI greater than or equal to 30 kg/m 2 was four times higher than in women with normal body weight. In addition, Ali et al. in Yemen had observed that occurrence of GDM in women with BMI greater than or equal to 30 kg/m 2 was 16.7 versus 4.4%. Clarification of reasons for different rates of increase in the incidence of GDM in different ethnic groups and whether their geographical location plays an important role. Thus, identification of potentially alterable factors that put women at risk for the development of GDM is important for developing clinical strategies for its prevention; moreover, modifiable risk factors for GDM (e.g., obesity) should be controlled and all women between 24 and 28 weeks of gestation, especially women with high-risk pregnancies, should undergo screening for GDM during the Antenatal care (ANC) visit. We concluded that the prevalence of GDM was 8% in Monshaat Sultan Family Health Center. In addition, the most significant risk factors for GDM were advanced age, BMI greater than or equal to 30, multiparity, present BP, preeclampsia, induced labor, preterm deliveries, abortion, large-sized baby, family history of diabetes, and smoking. However, sociodemographic data, small-sized baby, still birth, previous history of hypertension, and family history of hypertension failed to demonstrate significant associations with GDM. Colberg SR, Castorino K, Jovanovic L. Prescribing physical activity to prevent and manage gestational diabetes. World J Diabetes 2013; 4:256–262. Kaiser B, Razurel C, Jeannot E. Impact of health beliefs, social support and self-efficacy on physical activity and dietary habits during the post-partum period after gestational diabetes mellitus: study protocol. BMC Pregnancy Childbirth 2013; 13:133. Vanlalhruaii SR, Prasad L, Singh NN, Singh TP. Prevalence of gestational diabetes mellitus and its correlation with blood pressure in Manipuri women. Indian J Endocrinol Metab 2013; 17:957–961. Shaaban MA, Dawood AA, Ansr M. Role of iron in diabetes mellitus and its complications. Menouf Med J 2016; 29:11–16. Khan R, Ali K, Khan Z. Maternal and fetal outcome of gestational diabetes mellitus. Gomal J Med Sci 2013; 11:88–91. Al-Azemi N, Diejomaoh MF, Angelaki E, Mohammed AT. Clinical presentation and management of diabetes mellitus in pregnancy. Int J Womens Health 2013; 6:1–10. Nallaperumal S, Bhavadharini B, Mahalakshmi MM, Maheswari K, Jalaja R, Moses A, et al. Comparison of the world health organization and the International Association of Diabetes and Pregnancy Study Groups criteria in diagnosing gestational diabetes mellitus in South Indians. Indian J Endocrinol Metab 2013; 17:906. Bhat M, Ramesha KN, Sarma SP, Menon S, Ganesh Kumar S. Outcome of gestational diabetes mellitus from a tertiary referral center in South India: across-control study. J Obstet Gynaecol India 2012; 62:644. De Gurrola GC, Araúz JJ, Durán E, Aguilar-Medina M, Ramos-Payán R, García-Magallanes N, et al. Kernicterus by glucose-6-phosphate dehydrogenase deficiency: a case report and review of the literature. J Med Case Rep 2008; 2:146. Swami SR, Mehetre R, Shivane V, Bandgar TR, Menon PS, Shah NS. Prevalence of carbohydrate intolerance of varying degrees in pregnant females in western India (Maharashtra) – a hospital-based study. J Indian Med Assoc 2008; 106:712–714. Shobeiri J, Ghojazadeh M, Azami-Aghdash S, Naghavi-Behzad M, Piri R, et al. Prevalence and risk factors of gestational diabetes in Iran: a systematic review and meta-analysis. Iran J Public Health 2015; 44:1036–1044. Seshiah V, Balaji V, Balaji MS, Paneerselvam A, Arthi T, Thamizharasi M, et al. Prevalence of gestational diabetes mellitus in South India (Tamil Nadu) – a community based study. J Assoc Physicians India 2008; 56:329–333. Kanadys WM. Occurrence of gestational diabetes mellitus: prognostic value of diabetes risk factors. Arch Perinat Med 2009; 15:106–111. Schmidt MI, Duncan BB, Reichelt AJ, Branchtein L, Matos MC, Costa e Forti A, et al. Gestational diabetes mellitus diagnosed with a 2-h 75-g oral glucose tolerance test and adverse pregnancy outcomes. Diabetes Care 2001; 24:1151–1155. Soheilykhah S, MogibianM, Saghand SR, Rashidi M, Soheilykhah S, Piroz M. Incidence of gestational diabetes mellitus in pregnant women. Iran J Reprod Med 2010; 8:24–28. Rajput R, Yadav Y, Nanda S, Rajput M. Prevalence of gestational diabetes mellitus and associated risk factors at a tertiary care hospital in Haryana. Indian J Med Res 2013; 137:728–733. Erem C, Kuzu UB, Deger O, Can G. Prevalence of gestational diabetes mellitus and associated risk factors in Turkish women: the Trabzon GDM study. Arch Med Sci 2015; 11:724–735. Leng J, Shao P, Zhang C, Tian H, Zhang F, Zhang S, et al. Prevalence of gestational diabetes mellitus and its risk factors in Chinese pregnant women: a prospective population-based study in Tianjin, China, PLoS One 2015; 10:e0121029. Zokaie M, Majlesi F, Foroushani AR, Esmail-Nasab N. Risk factors for gestational diabetes mellitus in Sanandaj, Iran. Chronic Dis J 2014; 2:1–9. Yang X, Hsu-Hage B, Zhang H, Yu L, Dong L, Li J, et al. Gestational diabetes mellitus in women of single gravidity in Tianjin City, China. Diabetes Care 2002; 25:847–851. Seghieri G, De Bellis A, Anichini R, Alviggi L, Franconi F, Breschi MC. Does parity increase insulin resistance during pregnancy?. Diabet Med 2005; 22:1574–1580. Aktun HL, Uyan D, Yorgunlar B, Acet M. Gestational diabetes mellitus screening and outcomes. J Turk Ger Gynecol Assoc 2015; 16:25–29. Brody SC, Harris R, Lohr K. Screening for gestational diabetes: a summary of the evidence for the U.S. Preventive Services Task Force. Obstet Gynecol 2003; 101:380–392. Capula, Chiefari E, Vero A, Arcidiacono B, Iiritano S, Puccio L, et al. Gestational diabetes mellitus: screening and outcomes in southern Italian pregnant women. ISRN Endocrinol 2013; 2013:387495. Saxena P, Tyagi S, Prakash A, Nigam A, Trivedi SS. Pregnancy outcome of women with gestational diabetes in a tertiary level hospital of north India. Indian J Community Med 2011; 36:120–123. Ali AD, Mehrass AA, Al-Adhroey AH, Al-Shammakh AA, Amran AA. Prevalence and risk factors of gestational diabetes mellitus in Yemen. Int J Womens Health 2016; 8:35–41. Kirke AB, Evans SF, Walters BNJ. Gestational diabetes in a rural, regional centre in south Western Australia: predictors of risk. Rural Remote Health 2014; 14:2667. Cypryk K, Szymczak W, Czupryniak L, Sobczak M, Lewiński A. Gestational diabetes mellitus – an analysis of risk factors. Endokrynol Pol 2008; 59:393–397.